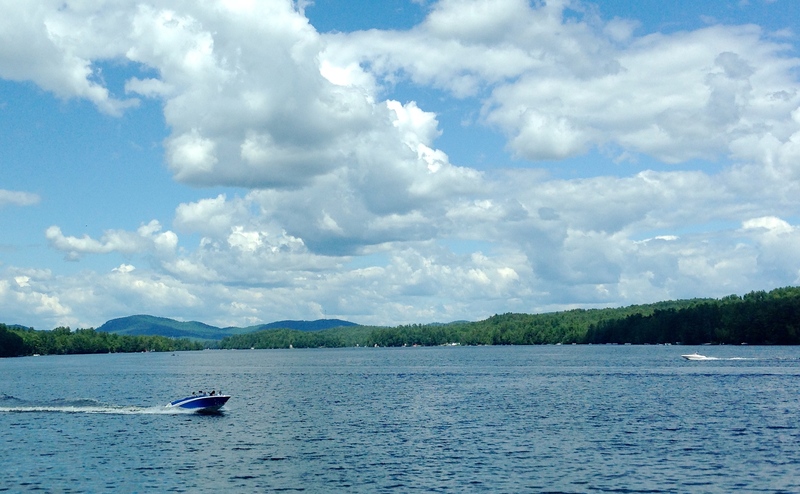 A week ago, I spoke a little too soon about needing some snow in New Hampshire. This week the January 2015 blizzard came to town. The snow started on Tuesday and never stopped. 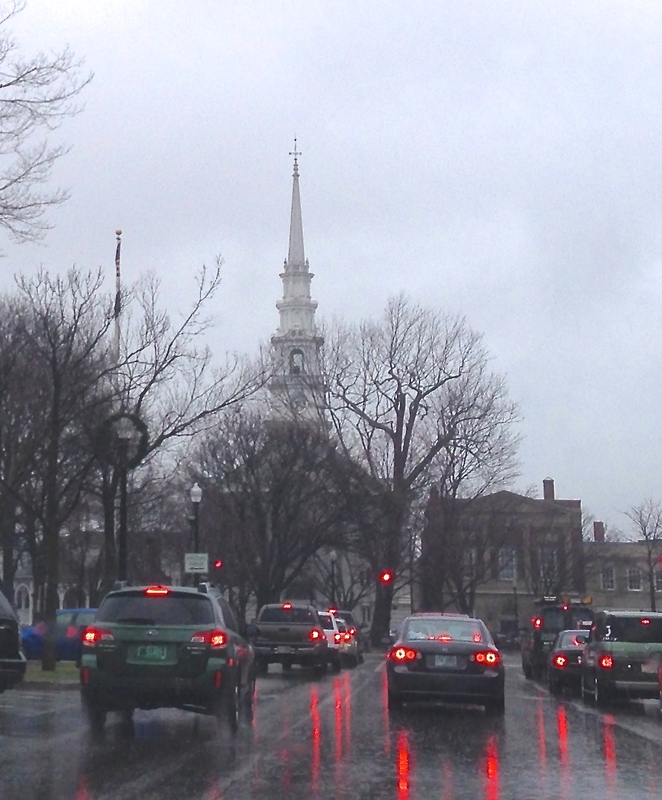 When all was said and done on Wednesday morning, we officially had 25+ inches on the ground in Exeter…. however, high winds whipped snow, swirled snow, and piled snow in every nook and cranny creating mountains you could get lost in. Beautiful to watch from the window with a crackling fire, a fine cup of java, and two good books to take me far away. 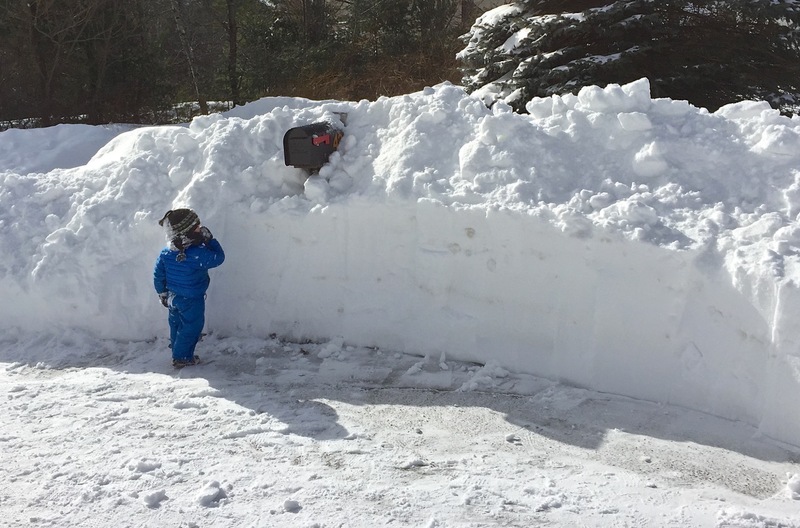 To give you an idea of the Great Dig Out, here is my grandson with his dog following along as his parents forged a path to their mailbox in Portsmouth, a city that received a whopping 31 inches of snow, according to local news. In Exeter, mister gardener dug a series of deep trenches to the bird feeders trying to keep our feathered friends well-fed for the duration of the storm. 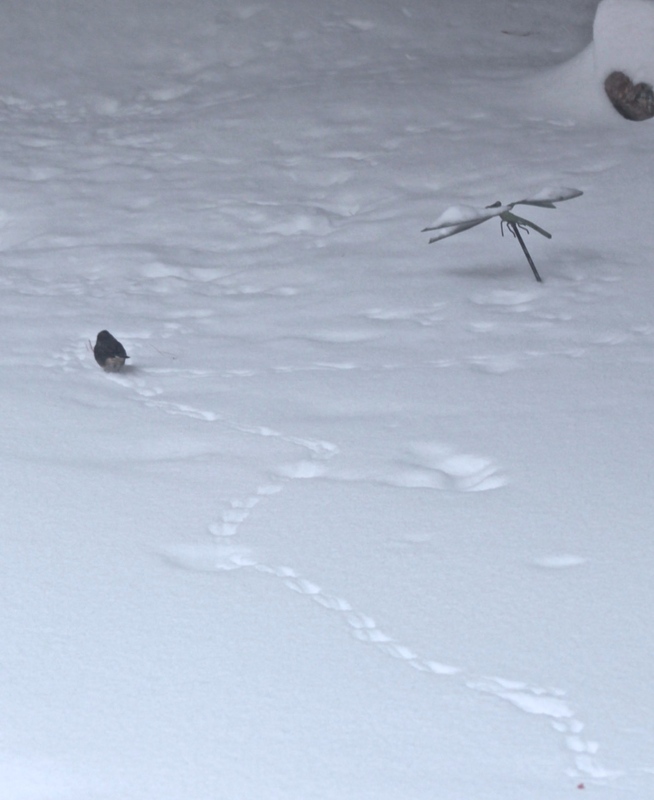 All birdseed we scattered atop the snow was completely covered within minutes. Before the storm hit, we built a small snowman with available snow on the deck railing. 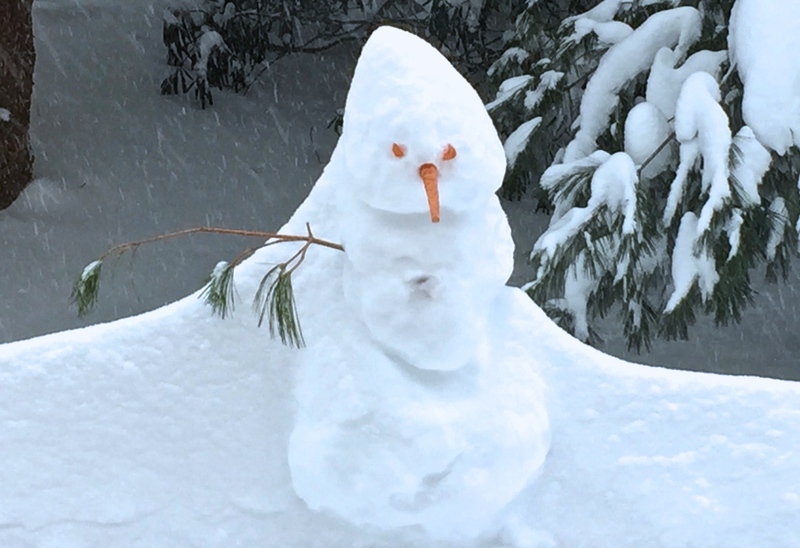 The snows of ‘Juno’ began and we were certain it would be the end of Mister Snowman. But he withstood the whipping winds of the blizzard. We found him standing upright in the morning although he’d lost an arm and had transformed into Mr. Conehead with a cape. Very slowly over the next three days, our little man began to lean more and more until he finally toppled and expired late today. The cleanup continues in New Hampshire with two more winter snowstorm warnings on the horizon. We are ready for them, but not for another threat that emerged this morning. 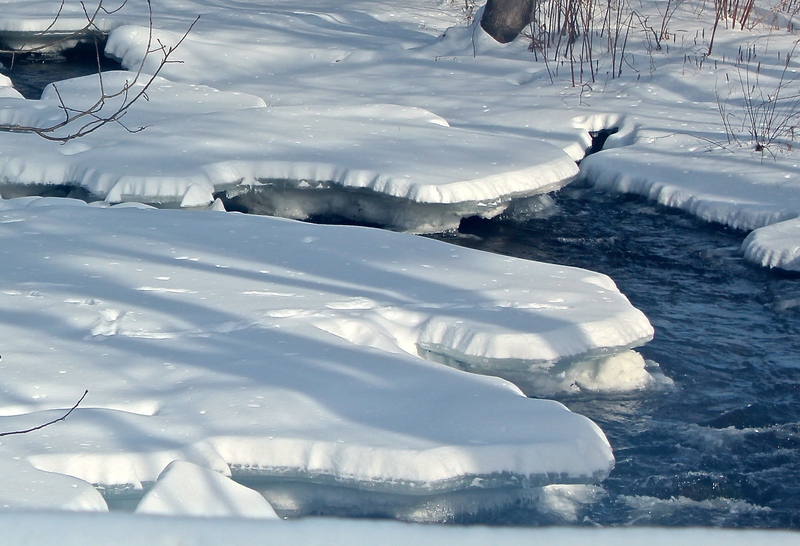 Icicles can possibly foreshadow the dreaded…. 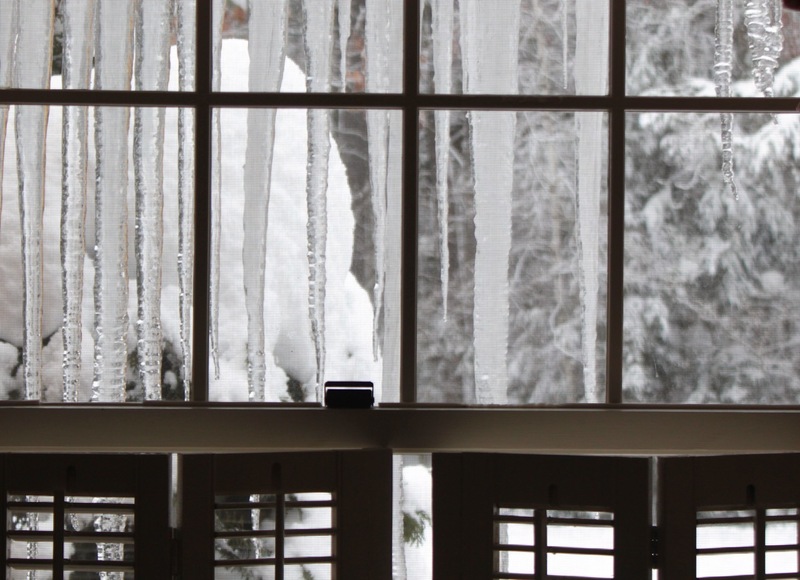 ICE DAMS …..identical to the one that caused a leak around our skylight last winter! Yikes! Give me a good snowstorm any day! 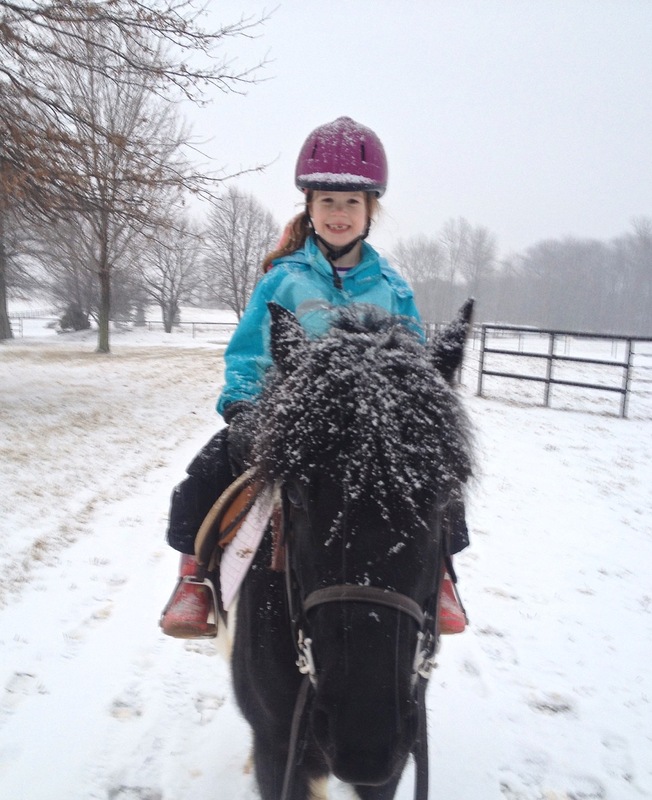 Our granddaughter, seen here with her pony, has had more snow at her home in the Midwest than we have in New England. 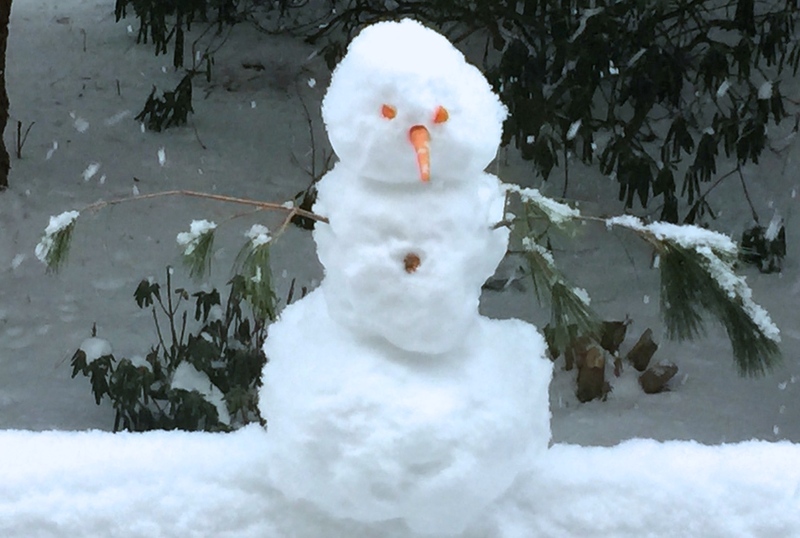 We’ve received family photos of snowmen and romps in the yard. How could that be? Shouldn’t we have more snow? We hear all that is going to change very soon as we’ll be getting the BIG SNOW beginning tomorrow morning. 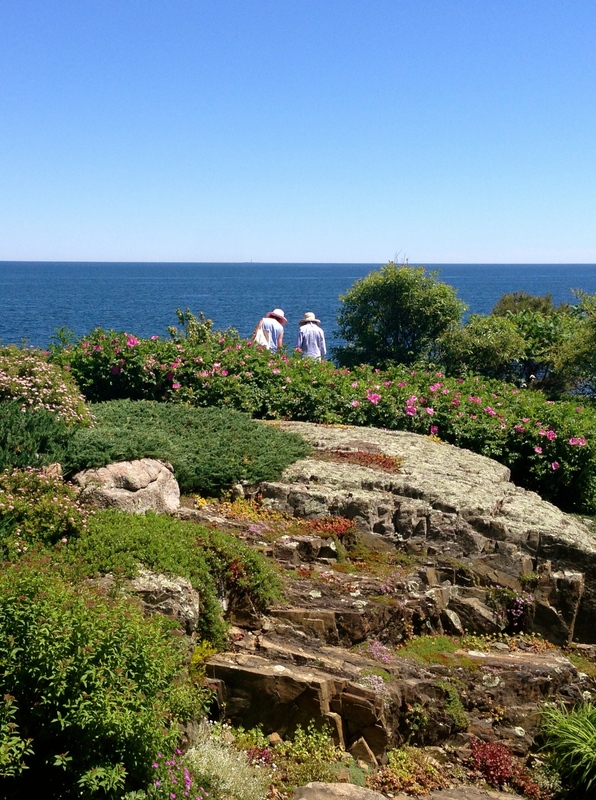 These hearty New England residents have missed seeing the white stuff. They don’t clear out grocery stores with stashes of survival foods like folks do in Virginia when threatened with snow. Here, their skis are waxed, boots lined up, sleds by the door, snowmobiles gassed up. They are ready. Our plans are less exciting than our adventurous friends. We might take a walk in the snow or sit by a roaring fire or watch the birds at the feeders or make some good soup or snap some photos. 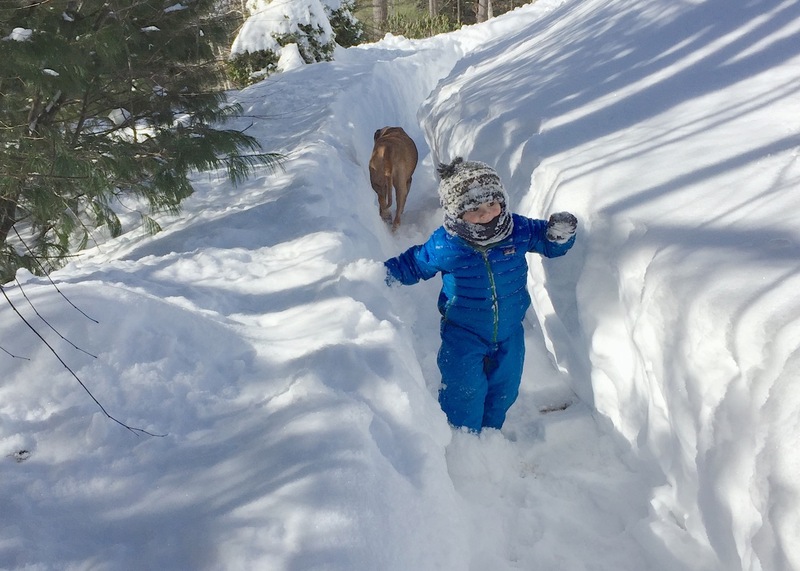 We have certainly missed the snow, but as southerners, we have not learned to embrace the outdoor adventures like our enthusiastic neighbors. We will likely venture out to keep our walks clear and will wave to all as they set out on their winter activities. … the mercury was down in the Atlantic Ocean on this January day. 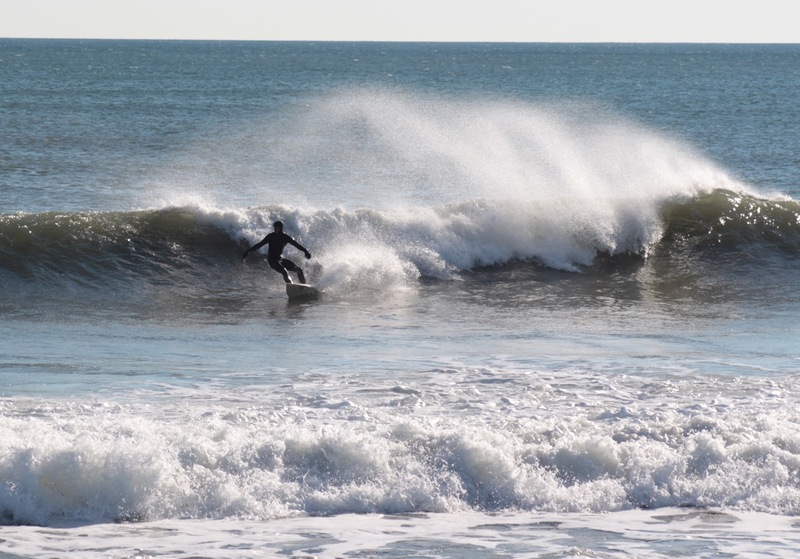 The icy 40° water temperature did not seem to deter our brave winter surfers! 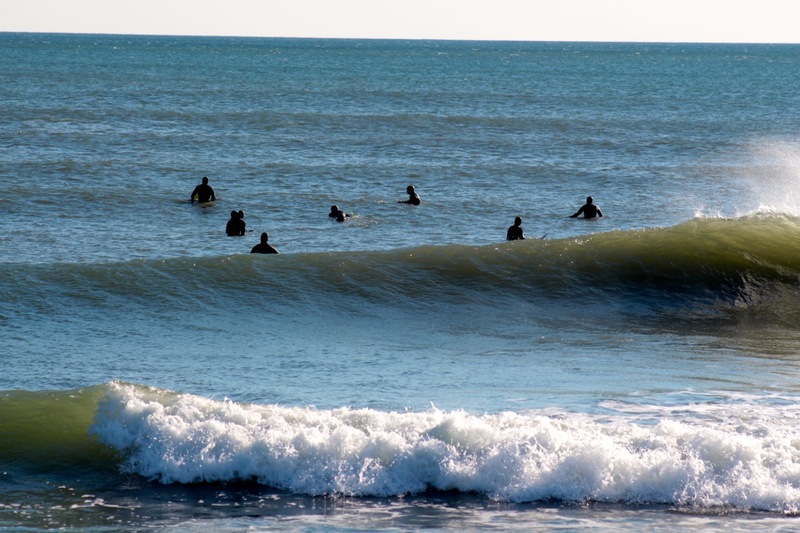 The popularity of winter surfing in New England simply amazes me. I’m told that many surfers prefer the winter when the sand isn’t packed with beachgoers and large numbers of surfers aren’t competing for the same perfect wave. Temperatures seemed mild today for January so we took the short drive to the beach to watch the action. Well… there they were. About a dozen or so surfers were bobbing in the water just waiting to catch a wave. I’m not exactly sure how warm they were but they appeared comfortable out there. It looked like every inch of their skin, except for the face, was covered in a thick wet suit and I’m sure faces were covered in a substance like petroleum jelly to protect the skin. I would think the most difficult part of this activity would be getting out of the water, back to their cars, maneuvering out of the skintight wetsuit, drying off and changing into dry clothes… likely done before the cars warm up! Gives me a chill to think about that. Just below me on the rocks were some shore birds huddling on a boulder, resting and trying to stay warm. I am not great on identifying shore birds but I do think the white breasted birds with dark legs may be non-breeding sanderlings. 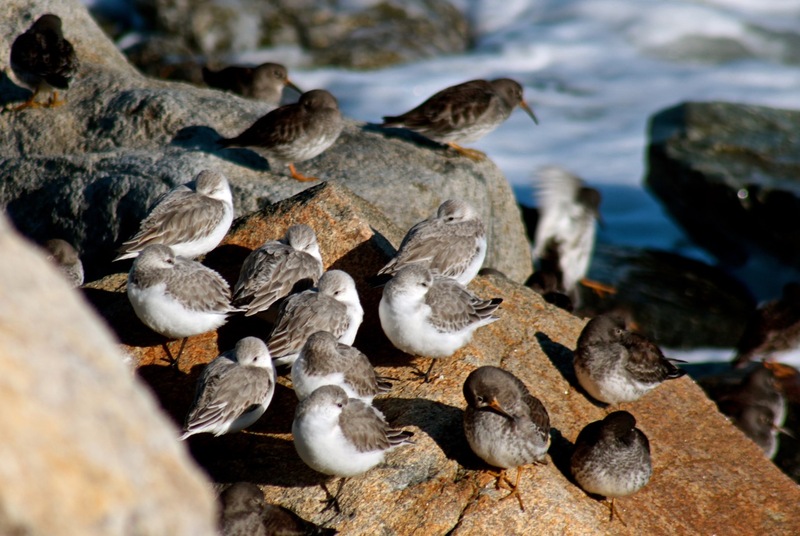 The orange legged and beaks belong to another species of sandpipers…. perhaps the purple sandpiper that winters here. Someone else may have to make positive IDs for me. Yesterday I attached a small bird feeder to the kitchen window. I used it for a while last year but the messy spillover on the basement bulkhead below resulted in removal of the feeder. My daughter’s interesting birds at her kitchen window convinced me to turn a blind eye to the oily mess and just enjoy the birds. 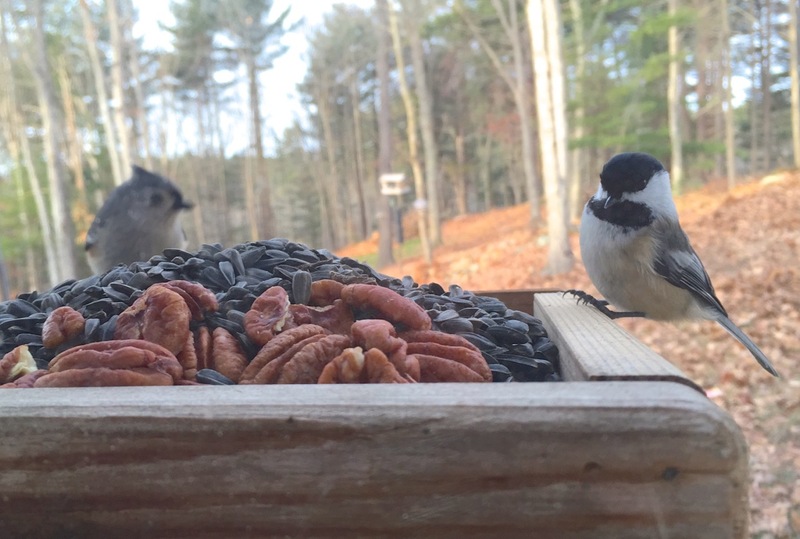 Immediately the bold little chickadees lifted out most of the nuts. Very early this morning before the sun was fully over the horizon, the American finches found the feeder filled with shelled sunflower seeds for those dainty beaks. Heck with the mess. C’mon little tweetie birds! The American Goldfinch is the only finch to molt twice a year. 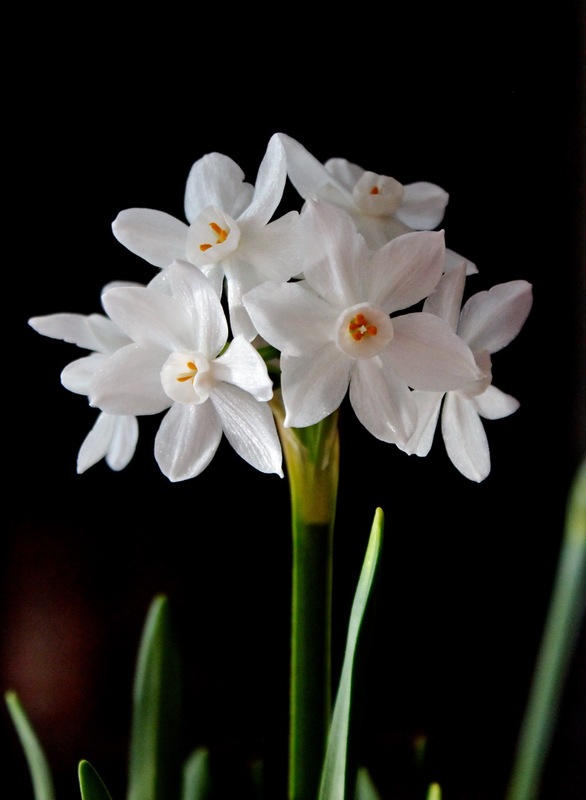 Their dull winter colors are a stark contrast to the bright yellow breeding colors of spring and summer. In Virginia, I participated as a Cornell Lab of Ornithology citizen scientist in a data collection survey called House Finch Disease Survey for Mycoplasmal conjunctivitis. 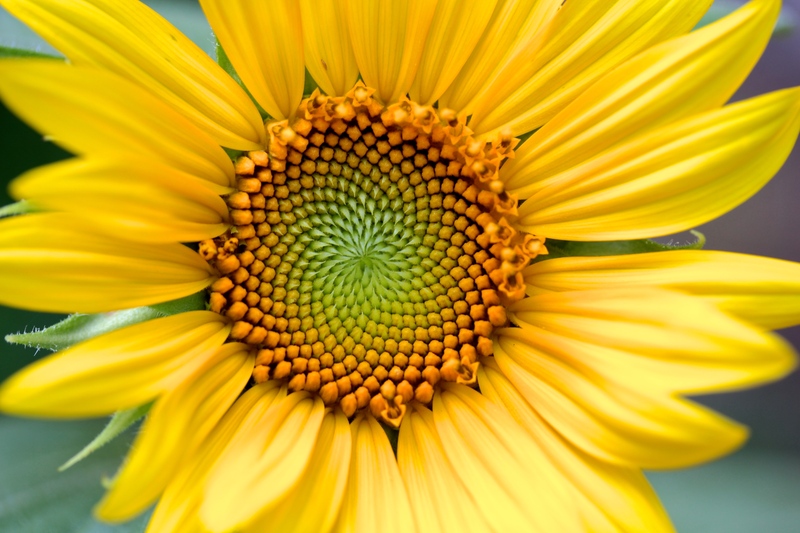 This terrible condition caused swollen, crusty eyes, and often blindness in a good number of my goldfinches, house finches and Northern cardinals. It was heartbreaking to watch a bird trying but unable to land on a feeder. Some diseased birds recover but many starve or are eaten by predators. 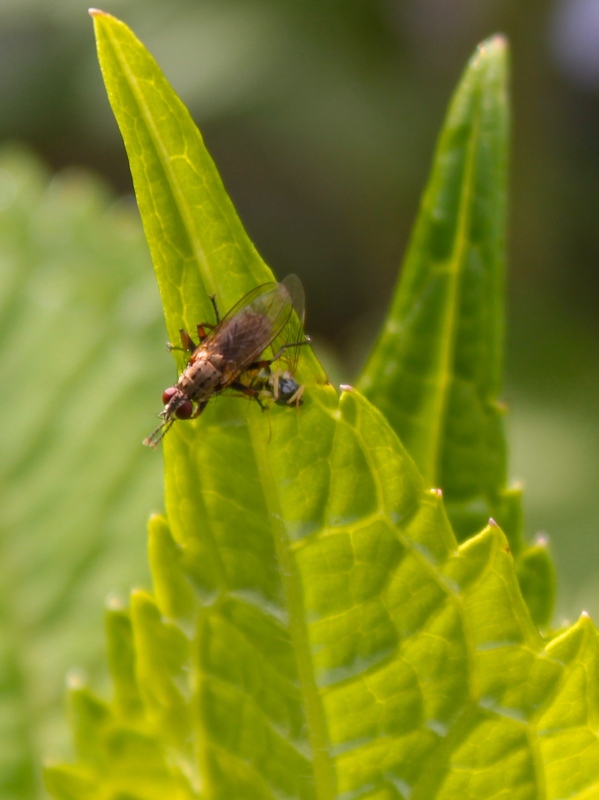 Because of the contagious nature of the disease, feeders are the best place for transmission. I regularly removed all feeders, disinfected them, and waited a week or so before hanging clean feeders and clean food. Thankfully, I have not seen this condition in New Hampshire. The survey has ended, however, one can report a disease sighting through Project Feeder Watch until April 3. 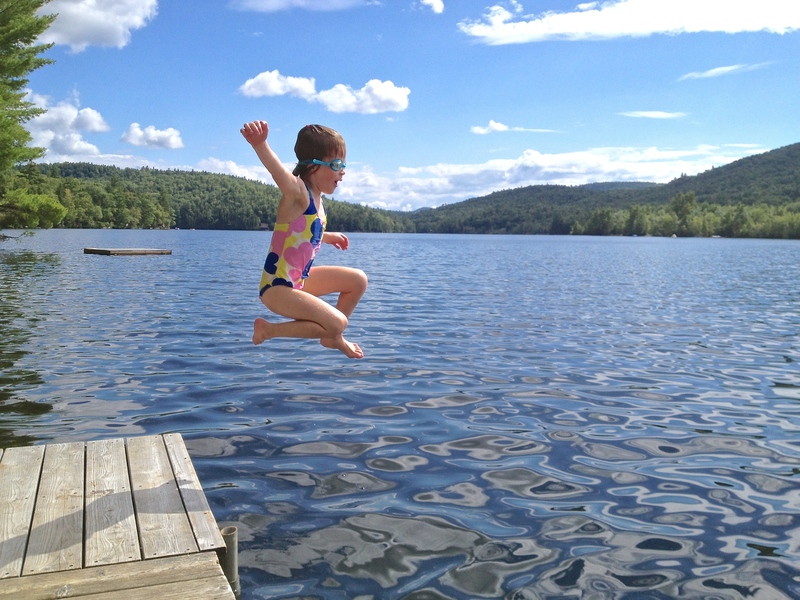 New Hampshire winters arrive early and by the time January rolls around we are yearning for green. So earlier this month we made an attempt to create a bay window herb garden in the kitchen even though we must deal with the low light winter sun and temperature fluctuations next to the window. Selecting an attractive planter was my job. No plastic planter on my windowsill! 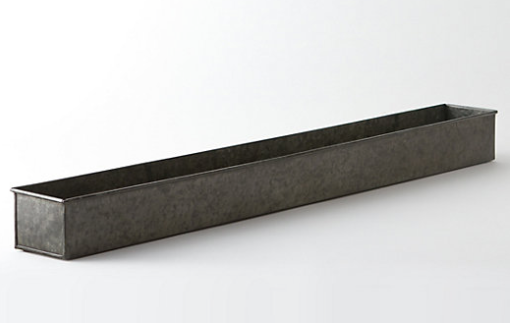 I wanted metal and I found the ideal trough at Terrain, one of my favorite online stores. The dark zinc metal tough is 36″ long, 5″ wide, and 4″ high and fits perfectly in the bay window. mister gardener was in charge of buying and planting herbs. We now have chives, basil, oregano, and sage growing in the kitchen and being used in cooking. Because they aren’t getting the needed 6 hours of sunlight, we supplement with a grow light. So far, so good. We are now satisfying our need to dig and tend a garden and mister gardener is having fun with our herbs elsewhere in the kitchen. Melt butter in a large pot. Add carrots, onions and salt and stir until softened but not browned, about 8 minutes. Add chicken stock, water, ginger and orange zest. 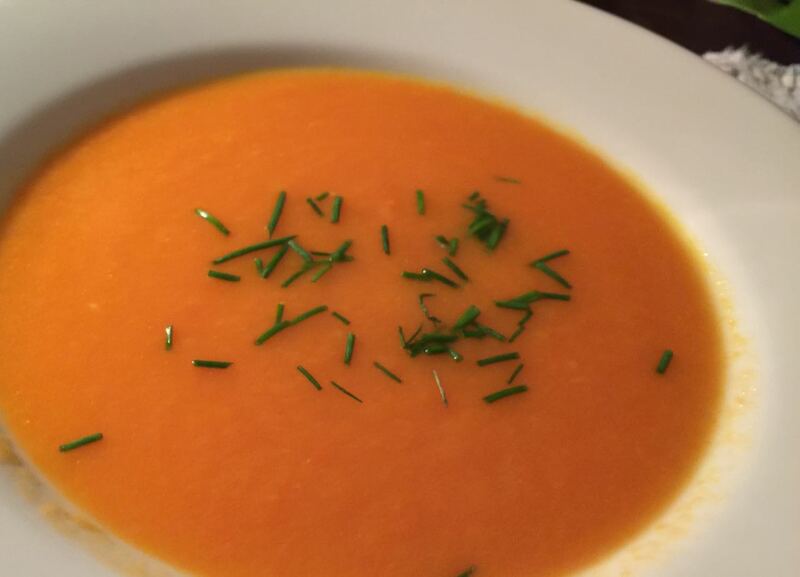 Bring to a simmer, cover until the carrots thoroughly soften, about 20 minutes. Remove the orange zest and discard. Add the soup to a blender in very small batches holding the lid down and purée until completely smooth. Add salt and pepper to taste. Garnish with chopped chives. It was frigid yesterday and we always take extra care of the birds in severe weather. Fresh suet, heated bird bath, filled feeders, and sunflower seed scattered to attract the ground feeding birds. Who came to dinner? Our neighborhood rafter of turkeys! I don’t dare intrude when our 18-20 hungry turkeys arrive. The gobblers can be a trifle aggressive and I sure don’t want to ruffle their feathers so I videoed a few of them from the window. The dominant Toms had slim pickings as they kept watch on the fringes allowing the rest access to the sunflower seeds that I scattered for much smaller birds on this icy morning. but my winter garden is doing great! 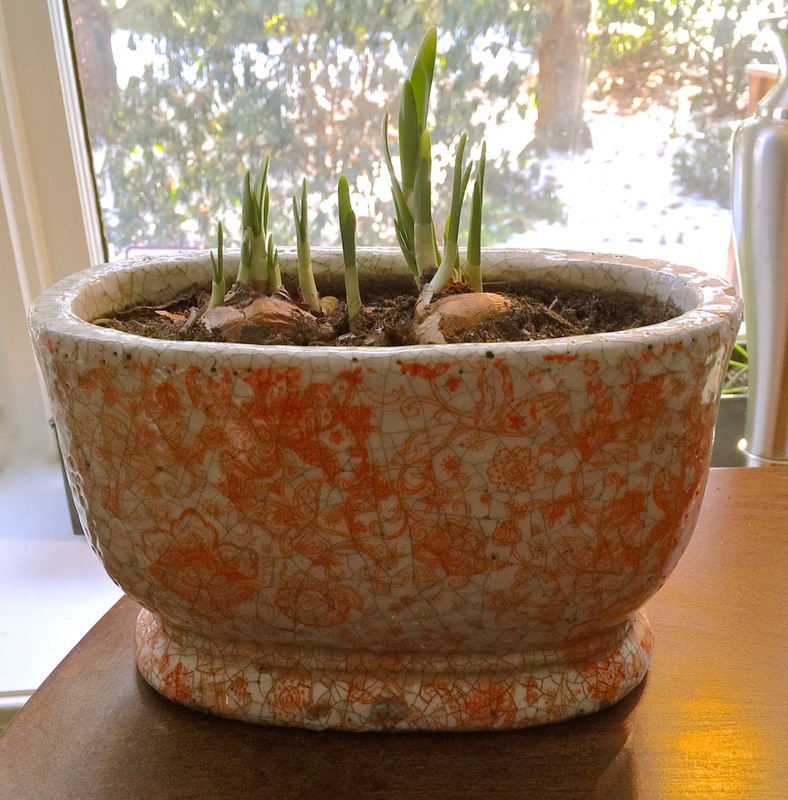 My Perfect Christmas gift… Paperwhites! On a rather gray day in October, mister gardener and I explored another recommended trail in nearby Stratham NH. Our goal was to find and climb a restored fire tower for a bird’s eye view of the surround. I’d never climbed a fire tower and could hardly believe folks were allowed to do it. We had no idea how far we had to walk but it turned out to be a rather short and gradual assent to the summit, an elevation of 280 feet. We soon approached a tree-tunneled opening and were surprised to find an expanse of well-maintained fields. To the right, a sign pointed to other trails but we could see the tower at the summit on the left. Well, I thought, that tower certainly doesn’t look imposing. I’ve seen taller. We walked up the dew covered grass and noticed the tower that seemed so manageable was looming larger as we got closer. 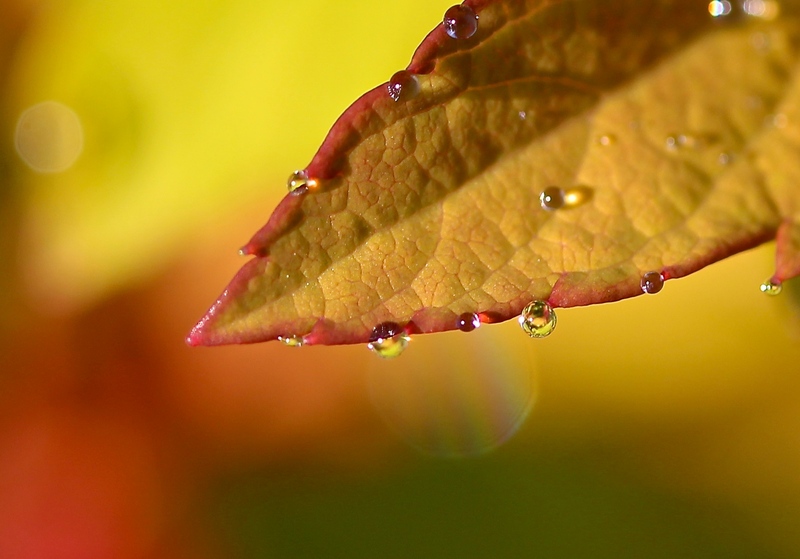 And once there, I saw that the metal steps were dew covered and slippery. I had qualms… but I swallowed my apprehension and began the slippery climb, holding on very tight and photographing each level as I passed with my free hand. The worst part was a see-through metal grate instead of a solid surface beneath my feet. 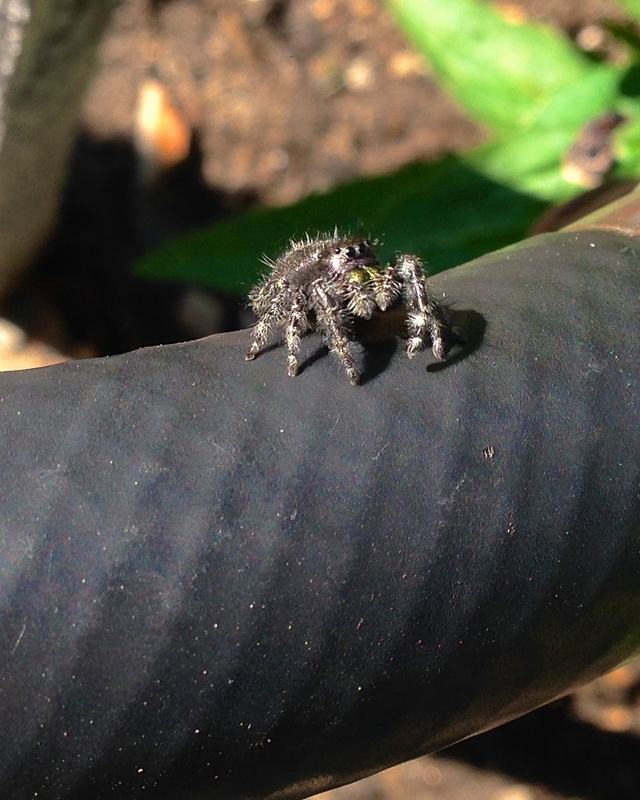 Whenever I looked down, I saw all the way to the ground. Add a breeze up there and I developed a slight case of vertigo. I didn’t linger. On a clear day not only Portsmouth and the Great Bay can be seen, but several mountains can be identified… including Mt. Washington 88 miles in the distance. Can you spot the picnic table? We are up high! Click to enlarge. I stayed long enough to see what people tagged on the beams… mostly nice thoughts but when I saw one about jumping, I decided it was time for my safe descent. On the way back down to the parking lot, we took a steeper trail, the Lincoln Trail named for Robert Lincoln, Honest Abe’s son. We stopped to read the plaque on a large boulder that marked the spot where Robert Lincoln, a student at Phillips Exeter Academy, read the Declaration of Independence on July 4, 1860, the year his father was elected president. Once back on level ground, we checked our GPS and found that we had logged less than 2 miles, a short walk. 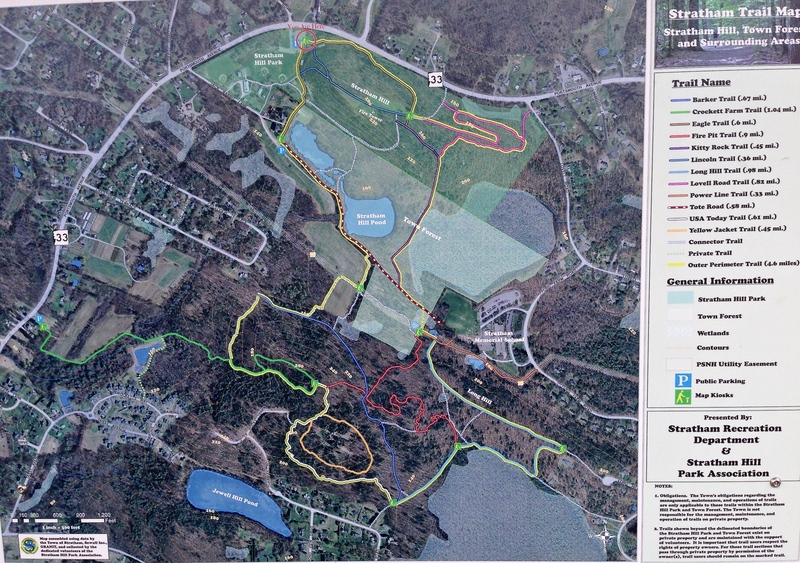 This map of all the trails in this area illustrates the amazing 9 miles of trails on both private and public land. We had barely scratched the surface! As a special treat to her feathered friends, my daughter added a handful of shelled pecans to the sunflower seeds on her window feeder. She wondered whether the birds would even like the nuts, but lesson learned. It took 15 minutes before all the pecans were gone. 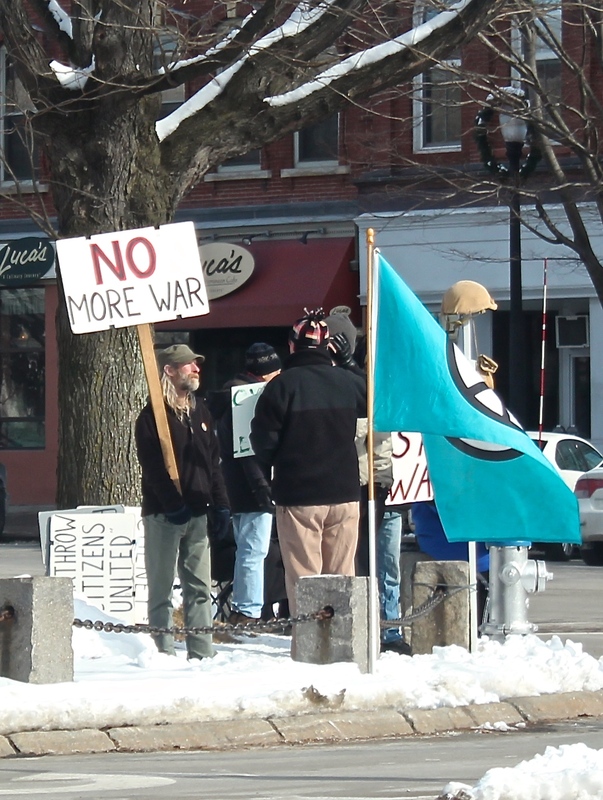 Click to enlarge photos. First the chickadee eyed them. 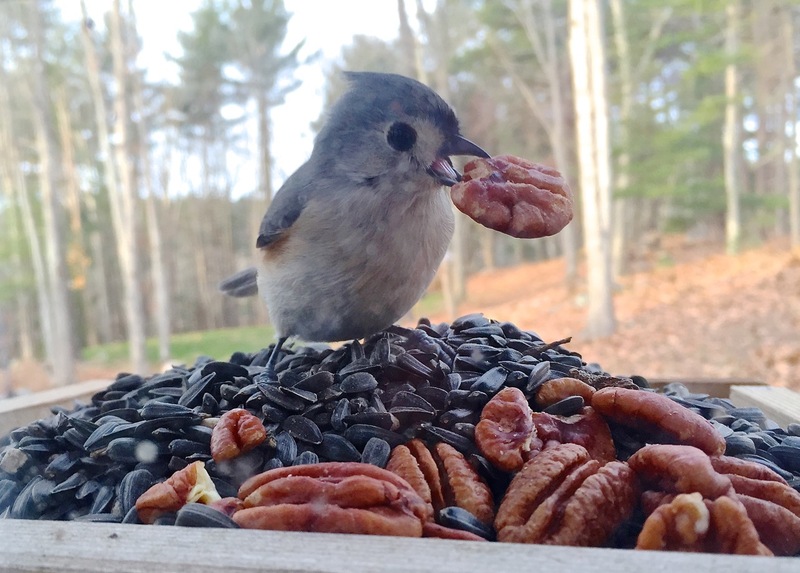 It was the titmouse’s turn next…. 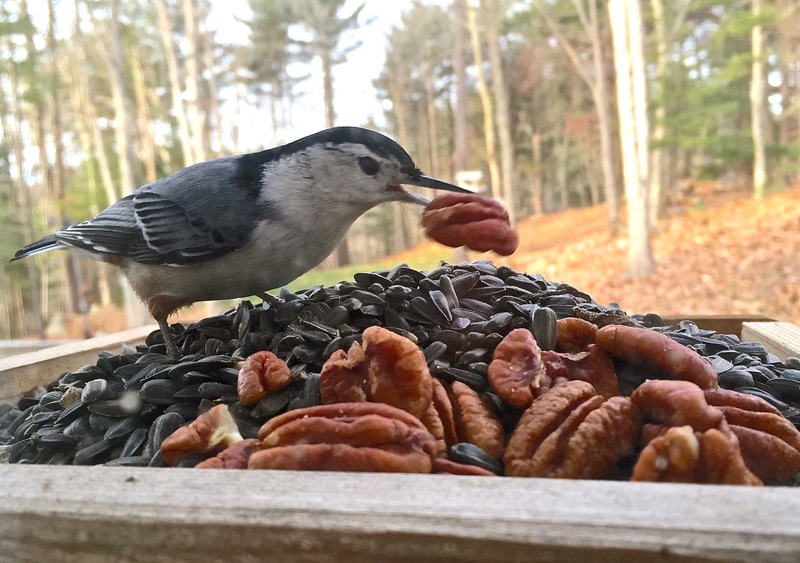 …followed by the white breasted nuthatch. All the regulars, the nut lovers, arrived to share a gourmet Christmas treat. Joy.